The other half of my coverage is also available. I’ve been playing board games pretty regularly since Mr Meeple decided board gaming was his new obsession. I’m generally his co-tester and guinea pig for all the games he buys ‘for review purposes’. We talk about the games, how they play, and the accessibility observations we make. Genuinely, the only reason he started Meeple Like Us was to justify the number of board games he wanted to purchase. One day he looked at the thousands of pounds he had spent on them and decided he needed to work out some kind of exchange rate for adult dignity. And so was born this blog. I play board games on a regular basis. I play with Mr Meeple and occasionally with friends of both of us. 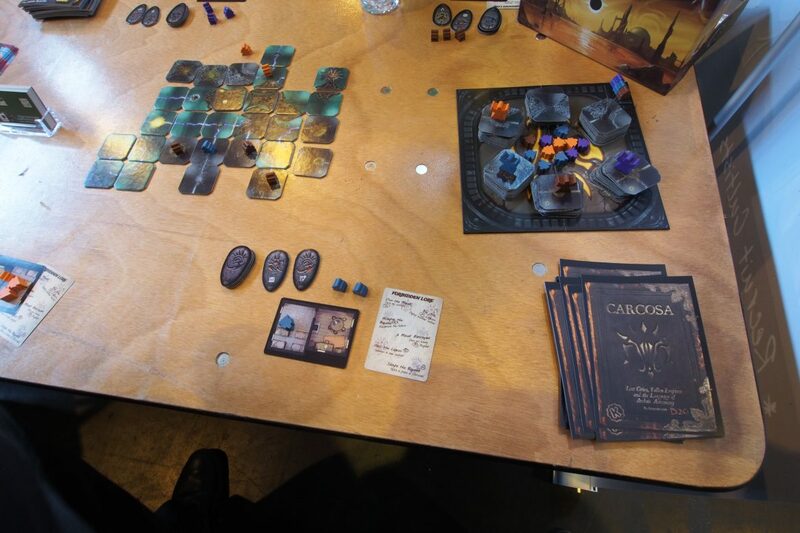 I also play games with another group on a monthly or so basis independently of Mr Meeple. I don’t though really consider myself a gamer. Mr Meeple is the one who watches all the YouTube videos, reads loads of board game blogs, and spends inordinate amounts of time on Boardgame Geek. He’s the one who knows what new games are coming out and which ones sound innovative or exciting either from a gameplay or accessibility perspective. He decides what games we are going to get. He buys the games, and he works out how to play them. Usually incorrectly the first time. I’m mostly just along for the ride. My diet of podcasts and YouTube channels is based around my more disparate interests of photography, strength and conditioning training, personal finance and climbing. 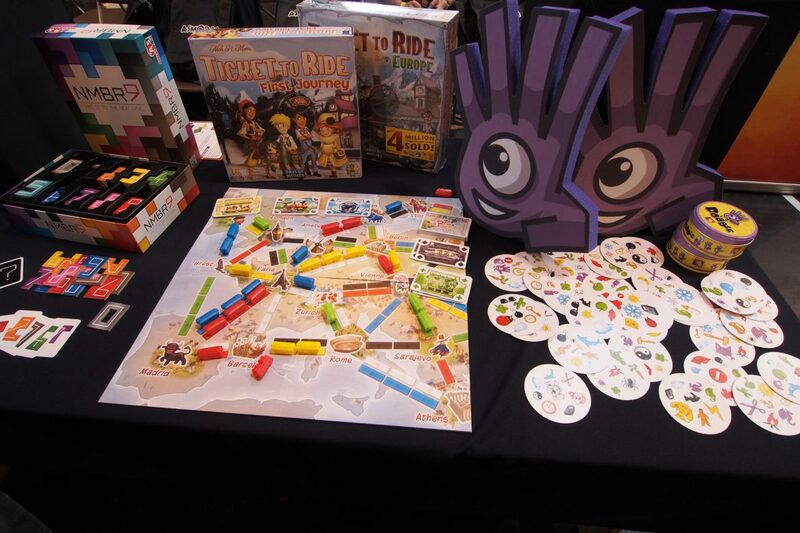 Mr Meeple and I went to the UK Games Expo this weekend, as a pair of novices with no gaming convention experience. 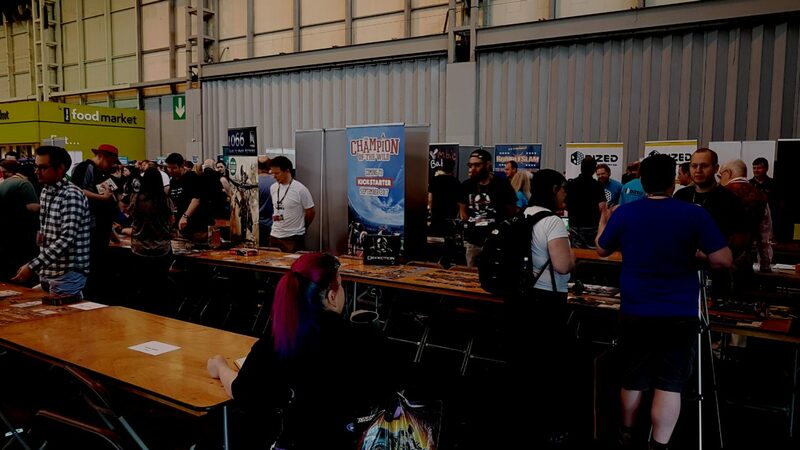 You might be interested to know what UKGE is like for someone who is much more of a casual gamer. What is it like for someone that likes playing board games but doesn’t have very in-depth knowledge of the field? What’s it like tagging along with someone for whom it is much more important? We arrived on the Friday a little late for the start of the press event, but over 90 minutes before the official opening time. 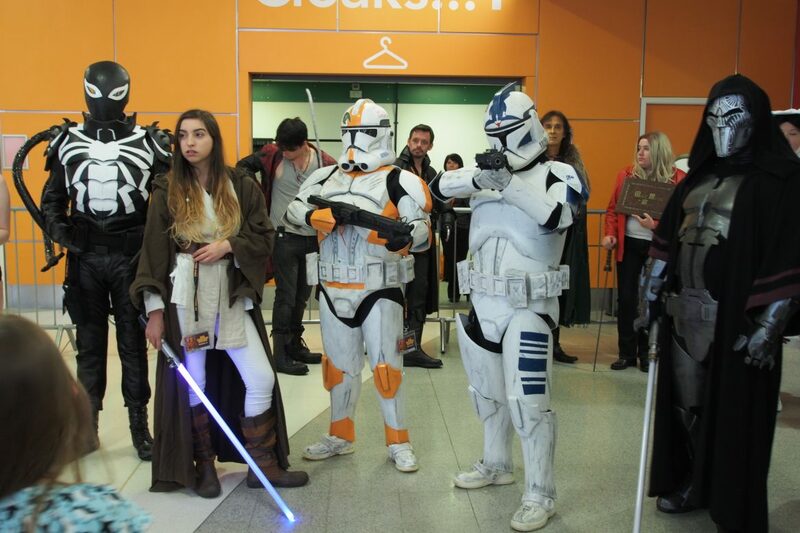 There was already a long queue to collect tickets. 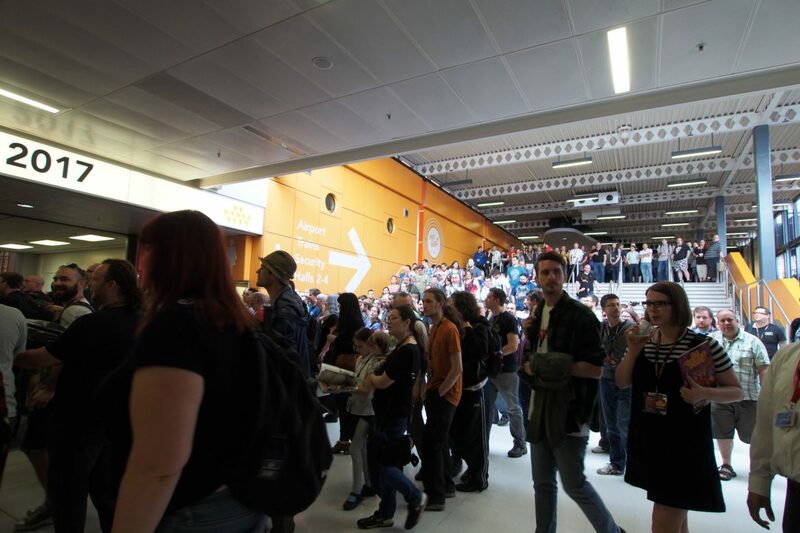 We were so glad we could join the comparatively tiny queue for volunteers, guests and press. Despite our press credentials being previously arranged, they either didn’t have a note of us in the system or had no idea how to interpret our broad Scottish accents. They gave us press passes anyway, even if they were quite possibly under someone else’s name. I don’t know what other parts of their identity we also stole but hopefully it included bank access because we spent quite a lot during the expo. Press passes give you a few perks, but the best of these is easily that we were allowed to skip the queue and enter the arena in advance of the general public. You get this early access so you can experience the ‘press preview’. Many stallholders were still setting up, and it actually didn’t look like it was going to be that big an event to me. I had no idea how we could fill three days at this thing. After wandering up and down a couple of the Expo ‘streets’ and wondering where everyone was we were approached by a member of staff who told us we should not be in that part of the hall. He directed us to the ‘Press area’ which was a small corner of the room. He seemed surprised we had been allowed through into the main arena. They seemed to think we were on the hunt for an early scoop (mental note – check to see if people actually say scoop) but really we were just utterly amateur and with no idea where we were going. We later found out that it was because we were 45 minutes late for the event so hadn’t been ushered through with the rest of the press. We were instead acting as kind of itinerant press hobos making the place untidy. I’d like to think we came across as ‘fashionably late’, but that’s probably just wishful thinking. You can apparently see Tom Vasel here. I know the name, I don’t know who he is. 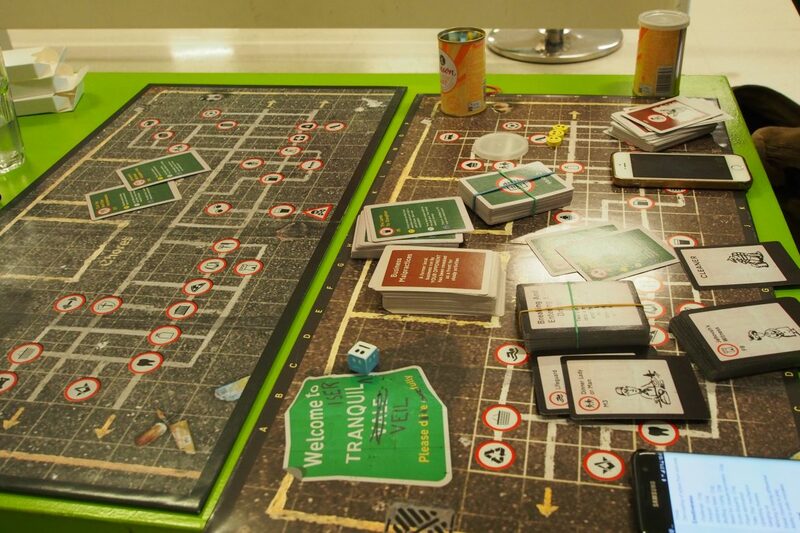 Since I don’t actually consider myself or Mr Meeple as ‘press’ I felt kind of awkward taking photos of indie game developers and their prototype games. Mr Meeple ambled past some hopeful game developers who were not talking to anyone at that point in time, and some of them would catch my eye and smile hopefully. I had no idea what to talk to them about so I just smiled and kept following Mr Meeple. He was utterly oblivious of much of this, as he is generally of most things in life. We did manage to catch up with a former colleague and his wife. They were also our guild-mates on World of Warcraft back in the day. I lost a few years of my life to Azeroth a long time ago. 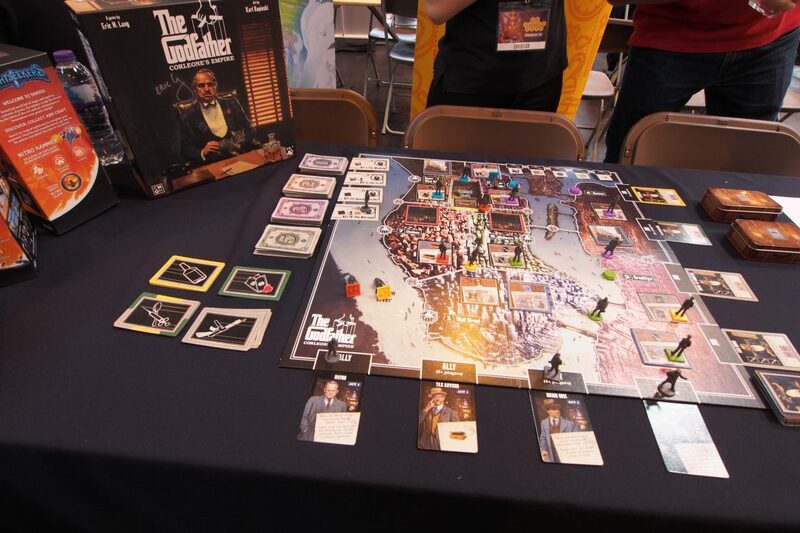 They were kick-starting their second board game and selling their first game – that one was just released earlier this month. I perked up when we went to see the makers of Dobble and they told us about all the exciting new expansions coming soon for Splendor. Mr Meeple may not have mentioned this in his review, but for the first several weeks after our first game of Splendor I consistently and viciously hammered him at it: I love straightforward engine-building games. There was more than just hearing about Splendor though. THEY GAVE ME A FREE DOBBLE HAND! You know, the giant foam ones people wear at baseball games? All because I said in passing that I liked them. Woot – I was very impressed at the sway that press badge gave us. That was until later in the day I realised they were handing out quite a lot of them, mainly to six year old children. I was the only person past about the age of sixteen with one. As a side note, many bloggers and reviewers struggle to avoid the slightest appearance of having been bought by a publisher. We on the other hand sold out EARLY and HARD and FAST for the low, low price of a branded Asmodee tote bag. We popped outside for some fresh air after the press event finished. By that point the size of the crowds that had been penned in as they were waiting to come down the stairs in waves was pretty overwhelming. Again, I thanked my lucky stars that we had been given someone else’s special access tickets. I’m sorry if someone ended up being escorted from the building by security because we had been mistakenly given the wrong passes. We were told later though that someone had already been to collect our tickets for a couple of the later events so it probably balances out. By the time we got back in we were pretty keen to find the press room to which we had been directed before heading out. It was so small and unremarkable that we walked past it several times. It looked a bit like the kind of cupboard into which they took unruly gamers and left them to die. We got accosted by a nice man with a luxuriant moustache (which was totally not at all fake) and 1920s garb including a flat cap. He was promoting a game called Gangs of Britannia, in which you play gangs from 5 different UK cities. I can’t remember the rules, but they were cleverly attracting the attention of passers-by due to their attire and their free prize draw with an interesting twist: you had to enter in pairs and play out their version of the Prisoners Dilemma. Mr Meeple and I entered and got to choose whether we were going to co-operate or backstab each other. We’ve been together for fifteen years. We’re in a strong, committed and loving relationship. We trust each other completely. Would you expect either of us to rat the other out? I knew our long, dedicated relationship was so strong that we would absolutely stand by each other. I refused of course to betray Mr Meeple, my life partner, because I would never stab him in the back. We are, after all, a team. He, on the other hand, sold me out in a heart-beat for the paltry reward of one single additional raffle entry. Love you too, honey. After that horrific deception and betrayal we popped to a stall to purchase Century: Spice Road since we had been told there would be very limited copies available over the weekend. The woman in front of us was swithering over whether or not to buy it as if she were unaware of its rarity. She didn’t purchase it in the end. By mid-afternoon there was only one store we could find with a copy of it left to sell. Things move fast at the UKGE. You either climb on board of events or get out of the way. We spent the rest of the morning browsing stores. For me, this was largely a meta-game of spotting games we already owned which is hardly scintillating. The Board Games in Libraries panel was a welcome break at 1pm, even though it meant a very late lunch. Mr Meeple had been asked by a Meeple Like Us reader whether he could meet up with us on the Friday. We eventually caught up with him and his friend around 4pm, during which time we played Ominoes – a half-decent dice rolling and area control game, and the super-size Colt Express. The giant version was much better from a physical accessibility point of view, but they’re not going to release it for sale. I got to extract revenge on Mr Meeple for his earlier treachery by shooting him and stealing his loot. And punching him and stealing his loot. And sending the marshal in to shoot him onto the roof so other people could steal his loot. The next item on the itinerary was a meeting with the creators of Tranquil Vale. They had heard Mr Meeple on the Our Turn! Podcast and immediately started redesigning their game in response. They brought their copies of the initial and re-designed board, the latter of which had much better colours, contrast, and to which grid references had been added. It was fantastic to see some actual concrete impact of our work on the site. There were still some improvements to be made to cards, but the discussion was probably the most productive part of the day. Although the meeting was productive, it did mean we ended up near the back of the queue for the SU&SD live podcast. Luckily we still got seats, but we were very near the back and I couldn’t get photos of them. Although they are hilarious and entertaining, I was so exhausted by this point that I nearly fell asleep in the warm, darkened room. We were booked in to a networking event afterwards but by then we were both so drained it was straight back to the hotel. Day one of the Expo, in other words, was exhausting. It was made more exhausting by the typically erratic organisation skills of Mr Meeple. Despite being the one to tell me the travel arrangements and the days we’d be travelling down, he only realised a couple of weeks before the event that he’d managed to forget to book us accommodation for the Thursday night. Part of our Expo experience was playing musical hotels. ‘Have you stayed at a Holiday Inn before?’ we were asked when we checked in on the Friday night. All that was left to do was shower, sleep, and prepare for the next day of the convention. We resolved to spend the next day chilling out and playing games. Lulled into uneasy and fitful sleep by the constant roar of the nearby motorway, we prepared ourselves for the next day of the convention. But that’s a story for another day, and another post. My biggest regret of the weekend is failing to acquire a Dobble hand for myself, and I was there working for them wearing one pretty much all weekend! Still, glad to hear the punters were enjoying it much as we were on Friday!